If you're interested in working and talking with other QRPers, then it makes sense to try and hang out where they hang out. Just like in Nature, the "watering holes" provide a place where like minded animals can meet and greet. This is not to say that QRPers confine themselves ONLY to these frequencies - nothing could be further from the truth. But if you are looking for a place where the odds of meeting other QRPers are stacked in your favor, then the above frequencies are a good place to go hunting. Also, keep in mind that a lot of homebrewed QRP gear is crystal controlled and you might very well find those rigs on the above frequencies as well. Does QRP really work ??? A very fair question. A lot of folks are skeptical and wonder, "Does QRP really work? What is a puny 5 Watts going to do for me?" If you've worked your entire Ham career at the 100 Watt level it is a very reasonable question to ask. Admittedly, back in the days when I was a Novice; and I was restricted to only 75 Watts, I wanted to be able break those confines at my pleasure, too. I was a part time member of the school of thinking that. "The more Watts, the better". But as you progress and mature and gain experience as a Ham, you begin to realize that it's not so much the Watts as it is what you do with the Watts. Brute power isn't the end all and be all. Operating skill, knowledge of propagation, patience and perseverance - these are what get the QSOs and the DX in the log! I've mentioned in several places that I've been licensed since 1978. Since the very beginning, I have always been attracted to and have dabbled with operating with low power. 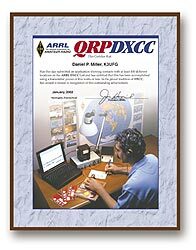 In fact, when I first joined QRP-ARCI in the late 70s, QRP was thought to be operating at levels of 100 Watts or less; and I still have my original QRP-ARCI certificate to prove it. But back in 2003, I decided to ditch QRO for good and have gone QRP solo since. I have never regretted that decision and have had a ton of fun ever since. In fact, I'd dare say that since I've gone totally QRP, I've had the most fun I've ever had as a Ham. So let me put my wallet where my mouth is and tell you some of the things I have accomplished using only 5 Watts or less. And let me state here for the record, that I have an uncanny sense of timing. 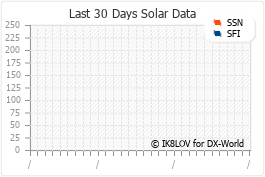 Since going QRP only, we have had one of the most pronounced and prolonged solar minimums in recorded solar history! So you must think me a masochist, no? No. I have worked all 50 United States and have earned WAS with QRP and CW endorsements from the ARRL, as well as the All States award from QRP-ARCI. I have worked All-Continents. I have not filed for that award, though, as I am still waiting on a QSL to come from Asiatic Russia. At this point it looks, like I may have to work Asia again. I have worked 110 DXCC entities at this point and have earned the QRP DXCC award. The pins in the map below will give you an idea of the areas of the world that I have worked. Hopefully, once Sunspot Cycle 24 heats up, I will be able to work deeper into Asia. I am not listing these achievements to brag or pat myself on the back and make me feel good about myself. What I am trying to say, is that if I can do this using only 5 Watts and a G5RV and a Butternut vertical, then YOU can do the same, and more! No, it won't get accomplished in a weekend - it took me several years. But look at it this way ..... Cycle 24 is starting to heat up and Ol' Sol is becoming more radio friendly again. In just a little bit you will probably be able to achieve way more than I have in a shorter amount of time. Go for it! But seriously, QRP may or may not be your cup of tea, It is fun and it is a challenge. If for some reason you've become bored with radio; then give QRP a spin. You just might find yourself having the same fun you had back in your Novice days. As you can see from the chart below, the quest for QRP DXCC took me several years. I like to work DX; but am not what you would call a "DXer". I work it when I hear it; or by partaking in the bigger DX contests. I don't normally run the TelNet server with the DX announcements, looking for the latest, choicest, juiciest DX. In fact, if I run the TelNet server at all, it's usually to make sure that I copied the call correctly of some DX station or DXpedition who's sending at close to 40 WPM !! !